There are a couple of ways to create a LUIS app. You can create a LUIS app in the LUIS portal, or through the LUIS authoring APIs. Start with an empty app and create intents, utterances, and entities. Start with an empty app and add a prebuilt domain. Import a LUIS app from a JSON file that already contains intents, utterances, and entities. Start with a prebuilt domain. On My Apps page, select Create new app. In the dialog box, name your application "TravelAgent". Choose your application culture (for TravelAgent app, choose English), and then select Done. The culture cannot be changed once the application is created. On My Apps page, select Import new app. In the pop-up dialog, select a valid app JSON file, and then select Done. An app with that name already exists. 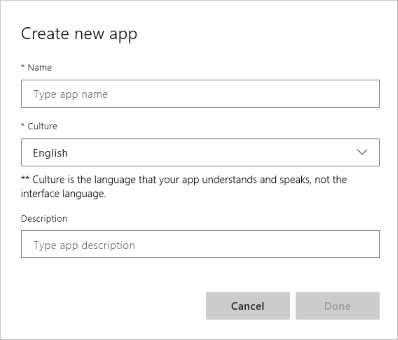 Reimport the app, and set the Optional Name to a new name. On My Apps page, select Export. Select Export as JSON. Your browser downloads the active version of the app. Add this file to your backup system to archive the model. Select Export as container then select which published slot (production or stage) you want to export. Use this file with your LUIS container. If you are interested in exporting a trained but not yet published model to use with the LUIS container, go to the Versions page and export from there. On My Apps page, select the three dots (...) at the end of the app row. Your first task in the app is to add intents.